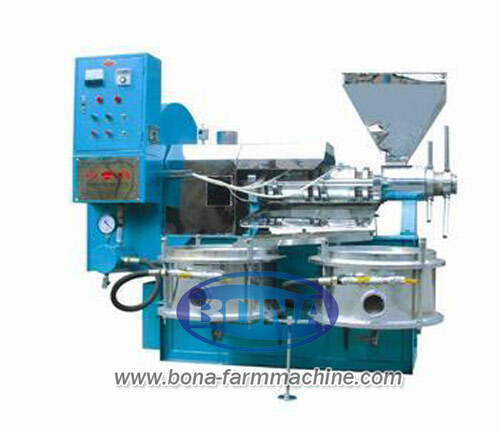 Oil press machine generally by means of mechanical force role embryos treated material from the hopper into the pressing chamber.In the next rotation of the pressing screw thread ,and gradually feed end to the cake side direction forward.So that each segment within the pressing chamber volume gradually reduced,then pressing screw thread continuously push the embryo virgin material breech,so before blocking push to product pressure,compressing the material embryo, the oil squeezed out ,oil press machine the following understanding some notes equipment normally used. Before using the press oil machine equipment(mini oil press machine),first check and adjust the tightness of the belt,and then start the motor,the machine empty running around 15min, speed checks pressing screw shaft. Do you want to pay attention to when idling gear box gear meshing and sound normal, whether the bearings and motor parts properly. After the normal load , the fuel feed hopper ready . Note: When you start squeezing feed not too fast, otherwise the sudden increase in pressure within the bore virgin ,virgin not turn the screw shaft ,causing blockage virgin bore,even to squeeze cage rupture, so repeatedly,for 3 hours or more, so that pressing oil- temperature gradually increased , the temperature at the start of the press virgin bore low, slowly twist the handle on the withered section stud,increase the thickness of the cake,while improving water into juice billet,to be pressing chamber temperature. Rose to about 90 ℃, the normal operation of the oil press machine,the cake thickness can be adjusted to 1.5 ~ 2.5mm, and tighten the nut tightened. After the oil press machine equipment functioning,high oil content of fuel oil are mostly concentrated in the bar press row and front row at the group round, more diesel oil can be uniformly doped with material embryos.To maintain uniformity when cutting, otherwise it will affect the life and oil rate. During operation should always check out the press cake case , the normal of the cake should be flaky,by pressing screw shaft side smooth , the other side has a lot of hair pattern. If the cake loose weakness,or a shapeless cake,darker color,hand pinch serve fragments,indicating little billet water,such as the cake soft, flaky NCKU increased,or the oil bubble, Minga said that too much water.Under normal circumstances,no or very little residue circular row between the slag,slag in place of discharge,such as slag was fine flakes description more water, the powder residue then the less moisture.